There’s a reason why we have antique stores: stuff used to be made to last. Things have long shifted, however, in favor of a manufacturing business model known as “planned obsolescence.” From toasters to T-shirts, today’s products are designed to fall apart—all the better to get you to reach into your wallet once more, of course. Flint and Tinder is one of growing number of companies seeking to disrupt that trend. After successfully Kickstarting its line of American-made men’s underwear, the Brooklyn-based label is back with a new crowdfunding campaign. Its goal? To create a unisex zip-up hoodie made entirely in the United States (yarn and hardware included) and built for a lifetime. 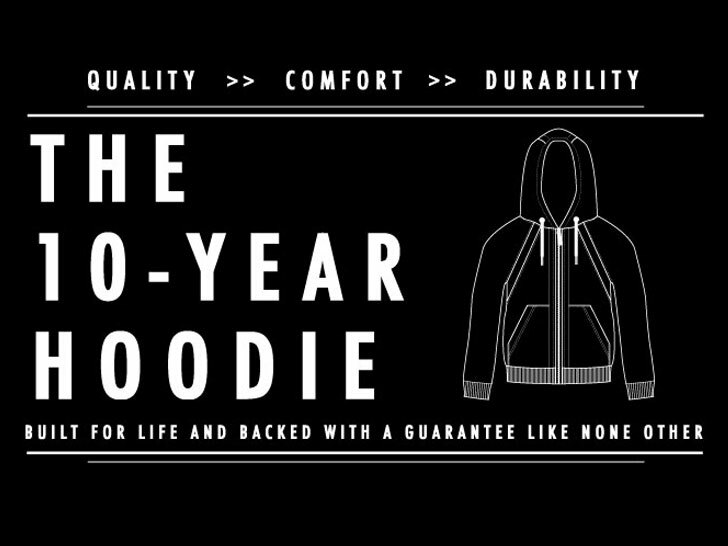 In fact, each “10-Year Hoodie” is guaranteed for—you guessed it—10 years. Say it rips, tears, or is otherwise in need of repair during the decade you own it. Simply send it back to Flint and Tinder and the company will mend it, for free. If your hoodie rips or tears during the decade you own it, Flint and Tinder will mend it for free. There’s little doubt that the hoodie will come to fruition. With 44 days left on its Kickstarter campaign, Flint and Tinder has already surpassed its $50,000 target. (Last time we checked, the sum hovered just under $129,000.) Obviously, founder Jake Bronstein has tapped into a particular need. For comparison’s sake, his original fundraiser—the one with the undies—made more than nine times its original goal. Are campaigns like this a sign of a growing thirst for U.S. manufacturing and smart, quality design? Perhaps. It could also be that we’re finally learning to value not only the clothes we wear, but also the construction and intent behind them. If you want to get in on the ground level, a $89 pledge lets you reserve a hoodie in your choice of color and size. There�s a reason why we have antique stores: stuff used to be made to last. Things have long shifted, however, in favor of a manufacturing business model known as "planned obsolescence." From toasters to T-shirts, today's products are designed to fall apart�all the better to get you to reach into your wallet once more, of course. Flint and Tinder is one of growing number of companies seeking to disrupt that trend. After successfully Kickstarting its line of American-made men's underwear, the Brooklyn-based label is back with a new crowdfunding campaign. Its goal? To create a unisex zip-up hoodie made entirely in the United States (yarn and hardware included) and built for a lifetime.